Here’s a guide on how to fix KERNEL SECURITY CHECK ERROR on Windows 10 as well as on Windows 8/8.1 desktop PC or laptop. The Kernel Security Check error is one of those dreaded Windows blue screen of death errors that can popup unexpectedly but not without its reasons as we are going to show you below in this guide. 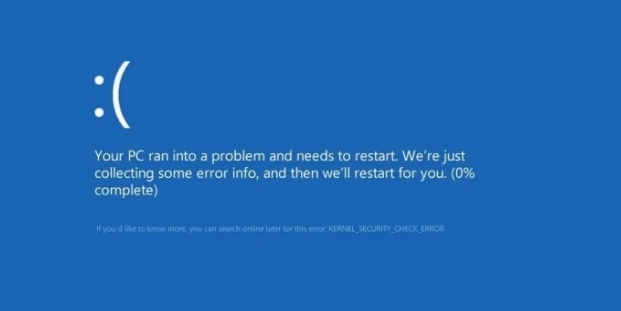 Although this Kernel Security Check Error is not as frequent as some of the other Blue Screen of Death (BSOD) errors in Windows, but you can’t completely rule out that it can’t happen on your device. Some Windows users who have recently upgraded from Windows 7, Windows 8/8.1 to Windows 10 are reporting this error on their devices. You can try restarting your device as a quick fix Kernel Security Check Error. But if you want to completely remove this BSOD error on your Windows device, see different solution methods below. When Kernel Security Check Error Occurs on Windows, you will see a screen similar to the one in the following image. Before moving on to the solution manual, let’s see some of the reasons that could be behind this KERNEL SECURITY CHECK ERROR in Windows and try to fix them. Main reasons that causes this kernel security to stop working properly on Windows is the incompatible and faulty hardware drivers. One of the reason why this error happens when users upgrade from Windows 8/8.1/7 to Windows 10 is perhaps the PC they have upgraded Windows on has older hardware drivers or outdated hardware which is not suitable to run smoothly on Windows 10. If this error occurs after upgrading to Windows 10, its because drivers are not compatible with new Windows 10 copy. Other reasons for kernel security check error include: antivirus/security software interfering with system processes, corrupted system files, faulty or corrupted hardware drivers, drivers incompatibility with Windows 10, hard disk not working properly. What Happen To PC With KERNEL SECURITY CHECK ERROR? When your PC is infected by KERNEL SECURITY CHECK failure error it causes running programs and apps to unexpectedly crash after which a blue screen with kernel_security_check_error STOP Error 0x139 message appears on the screen. Which then prompts users to restart PC to get it back to normal. Things should get back to normal after restart, however, if things remains as they were, then its time to permanently fix KERNEL SECURITY CHECK ERROR before it causes long term damage to your Windows device. See different solutions to fix KERNEL SECURITY CHECK ERROR on Windows. We have mentioned different solution so that if one doesn’t work you can try the next one. Each solution relates to different reasons behind the error that may be afflicting your device. On the list of drivers, see which one has a little yellow colored triangular warning sign next to it. Right-click on the faulty driver and select disable or uninstall the faulty driver option. Update the outdated, faulty driver by downloading the one from the manufacturers website. But before uninstall or disabling faulty drivers is always better to try updating it. If the error happens after upgrading to Windows 10, then you may need to update PC hardware drivers first before moving on to the other solution methods given below. If the drivers’ list in the device manager is not showing any outdated or damaged driver, you can run Driver Verifier tool on Windows to automatically search for the faulty driver. This tools runs on Windows OS to look for incompatible, damaged drivers on your device. Click on the Start Button shown by Windows logo on the taskbar. Search Verifier and hit enter. On the Driver Verifier Manger window, check Automatically select unsigned drivers option and hit next button. You will now see a list of faulty, damaged or corrupted drivers in Driver Verifier Manger screen. Simply, update or uninstall faulty drivers and reinstall a new version from manufacturer’s website. To know more about Driver Verifier tool, visit official Microsoft page. Another way of fixing Kernel Security Check Error is to repair damaged drivers on your Windows device from Chekdsk utility. Press Windows key + X on keyboard, or right-click on the Start button. Select Command Prompt (Admin) from the list. In the Command Prompt, type chkdsk /f c: and hit enter. Now press Y key and then enter to restart PC. Wait for the process to complete after which Windows drivers should be repaired and fixed. One of the biggest reason behind Kernel Security Check Error persistently happening on your device is corrupted system files. If the system files on your Windows copy are corrupted you can repair them by following the steps in our guide on how to fix/repair corrupted system files. Another solution would be to clean boot Windows to see if that fixes Kernel_Security_Check_Error on your device. Clean boot is an amazing way of finding out what exactly is causing issues on your device. This way you can also find out if any third-party tool is behind the error or not. Disable all running programs and restart PC. If the PC restart without any issues, it means there is nothing wrong with installed programs. However, If PC is facing issues restarting, it means problem is with one of the startup programs. Try above mentioned solutions one by one to see if they solve the issue on your device. However, if the problem remains as it is. Run full system scan using primary Antivirus tool on your PC if the problem is being caused by virus attack. If nothing else work, then your next course of action should be restore Windows on your device to get it back to previous working point in time when there was no Kernel Security Error on your device. Here’s how you can restore PC back to previous point in time to fix KERNEL SECURITY CHECK ERROR on desktop or laptop. Sometimes system restore doesn’t work as expected, in such cases, try system restore fix solution to get it back to normal. If all else fails to work, it time to take a bitter pill and restart or reinstall Windows copy on your device. Backup all data and reset Windows. This will surely fix the problem. After resetting Windows, you can restore backup to get your apps and program back on Windows powered device. Let us know in the comments section below if you are still facing issues in fixing Kernel Security failure error on Windows device. How To Enable Virtual Touchpad in Windows 10.